Alan Scott, a Californian ophtalmologist in the early 70’s started researching a neurotoxin to weaken the oculomotor muscle as an alternative to surgery in the treatment of strabismus in infants. He established that Botulinum toxin type A was the best candidate to paralyse temporarily the muscles, as varying the dosage could modulate the effect. John Lee, a ophtalmologist at Moorfields Eye Hospital , brought the toxin in his hand luggage on a plane from the United States in 1982, following a trip to meet Alan Scott. John Elston who worked with Lee, extended the use of botulinum toxin to the treatment of Blepharospasm in 1985 and hemifacial spasm in 1986. It spread quickly to the neurological community of movement disorders specialists, with David Marsden at King’s college hospital and his large research fellow group, who each took back the treatment to their own country (France, Germany, Italy, Spain ). 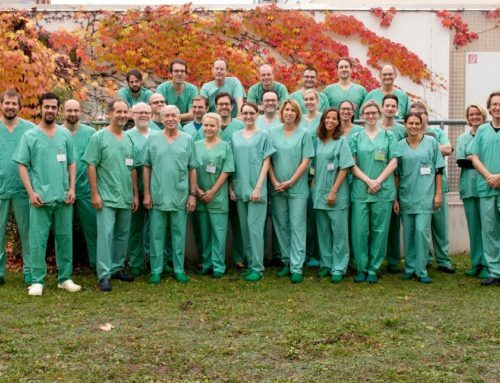 I had the privilege to be part of this group at that time and pioneered this treatment in France in 1986. I took my new position as chef de Clinique in the department of professor Jean Lapresle in Kremlin-Bicetre hospital in Paris in September 1985. Prof Lapresle was always interested with new developments in neurology and was very supportive, allowing me to start as soon I got the approval of the ethical committee in April 1986. Patients with hemifacial spasm and blepharospasm were the first neurological indications and the patients were admitted for 48 hours for their initial injection. 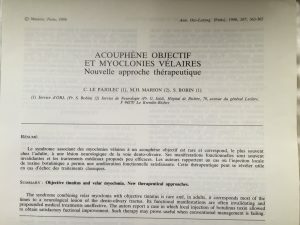 I presented my first series of patients with hemifacial spasm in July 1987 at the Societe Française de Neurologie in Paris.were the first neurological indications and the patients were admitted for 48 hours for their initial injection. I presented my first series of patients with hemifacial spasm in July 1987 at the Societe Française de Neurologie in Paris. The Botulinum toxin type A was supply by CAMR, Porton down, under the supervision of Peter Hambleton, on patient name basis up from 1986 to 1988. Then Chimos Company, in Paris organised the importation of the Botulinum toxin from Porton down, on reception of the “green” authorisation of importation by the chief pharmacist from the French health minister for every batch of 2000 units vial. In 1991, Porton Down products commercialised a formulation of the Botulinum toxin A, that they branded Dysport (DYS for dystonia and PORT for Porton down), each vial containing 500 units. 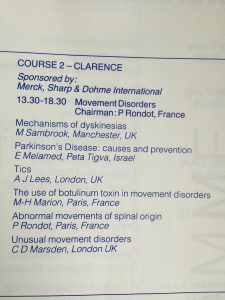 In 1990, the botulinum toxin injections were already recognised as a major advance in the treatment of movement disorders and Anita Harding, from the organising committee of 2nd European Neurological Society meeting (ENS) in 1990 in Brighton, asked me to do the teaching on “the use of Botulinum toxin in movement disorders”. The list of indications in neurology has since widened, and is not yet closed. 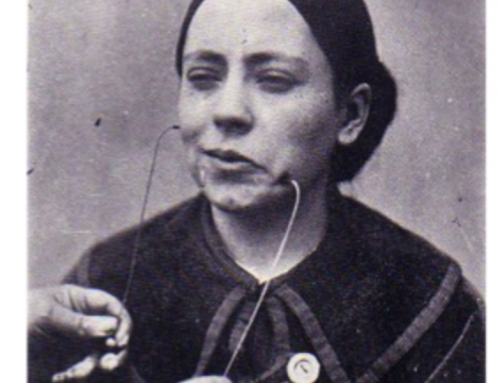 The licence in France was given in 1993 at the same time to the 2 preparations of Botulinum toxin A, Oculinum 100 units (Allergan) and Dysport 500 units (Porton down) for the treatment of blepharospasm, hemifacial spasm and cervical dystonia. From 2 centres in 1986 in France ( Prof Adenis, ophtalmologist in Limoges and Dr MH Marion, neurologist in Paris), it increased exponentially to 10 centres in 1990, 43 centres in 1993 and now more than 150 centres in 2016 for the treatment of dystonia. Dystonia affects different functions; so different anatomical regions can be involved in the dystonic spasms, requiring a multidisciplinary approach. 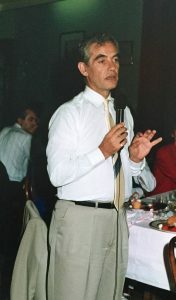 In 1989, I started to collaborate with Patrick Klap, in the ENT department at the Fondation Rothschild on the injections of Botulinum toxin into the vocal cords for the treatment of spasmodic dysphonia, a laryngeal dystonia;. We described in 1992 a series of 6 patients with stridor related to breathing laryngeal dystonia with normal voice, and immobile vocal cords in paramedian position on fiberoptic laryngoscopy. It was thought in the past to be due to a paralysis of the abductor of the vocal cords. (Gerhardt’s syndrome). The Inspiratory stridor occurred during the day, disappeared during sleep and was increase by exercise, eating, drinking. 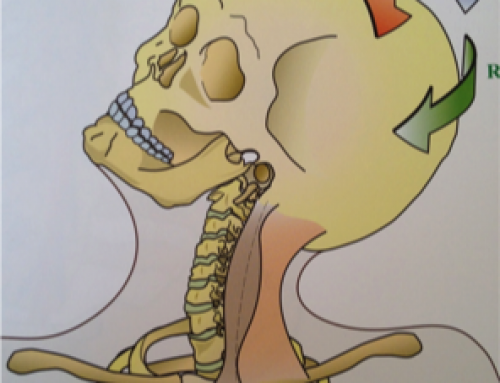 The patient who initiated this study , was treated for a cervical dystonia, with Botulinum toxin injections. When he presented later with a stridor, a surgical treatment was proposed to the patient, who refused, as he did not want to loose his voice. 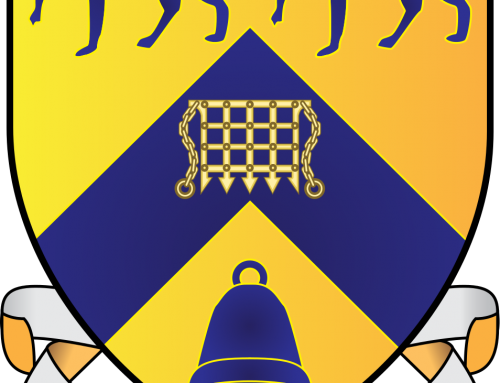 He insisted that we considered the possibility of a unique mechanism for his cervical dystonia and his stridor and to be treated with the toxin. The electromyogramm confirmed the absence of paralysis of the abductors and the presence of bursts of activity in his thyro-arythenoid muscles. The stridor was abolished by the injection of Botulinum toxin into the thyro-arythenoids muscles. 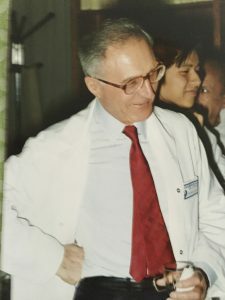 We also were privileged in July 1991 to receive the visit of Andrew Blitzer, ENT surgeon in New York, and the pioneer of the use of the toxin in the larynx and into the jaw muscles. We booked at that occasion the most challenging patients for us, in particular a young girl with severe trismus due to a heredo-degenerative condition, PKAN. He taught us how to inject the median pterygoid muscles with an external approach, avoiding to this young patient a procedure under general anesthesia every 3 months. As much as we learnt from his teaching, as much Andy discovered the pleasure of French gastronomy! 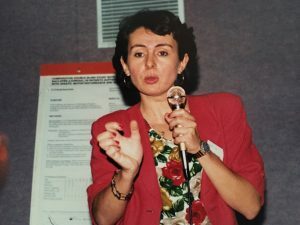 Another collaboration Neuro –ENT took place in 1989 at Kremlin Bicetre hospital with Christine Le Pajolec, ENT surgeon. We treated a 40 years old man who presented for 20 years with Palatal myoclonus and objective tinnitus with a frequency 80/minute. We treated him successfully with 40 units Dysport divided in 2 sites into the levator veli palatini (Le Pajolec, Marion, Ann Oto-laryng (Paris), 1990). In 1995, we started injecting Spastic children in the lower limbs with Dr Alain Lespargot, a neuro rehab paediatrician, from the Tardieu school. At the same time, i collaborate also with Dr Benjamin Asher, plastic surgeon (1995) injecting the facial muscles for expression lines. I ask him to join me and Lespargot to treat the spasmodic retraction of the upper lip by injecting the levator labii superioris muscles, improving the lip occlusion during feeding and the gum trophicity of spastic children. They was not limit to the multidisciplinary approach! 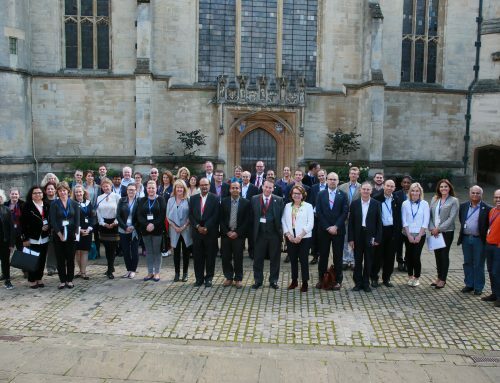 I remembered it as a very exciting time, with stimulating exchanges with colleagues and trainees from other countries and from other specialties. 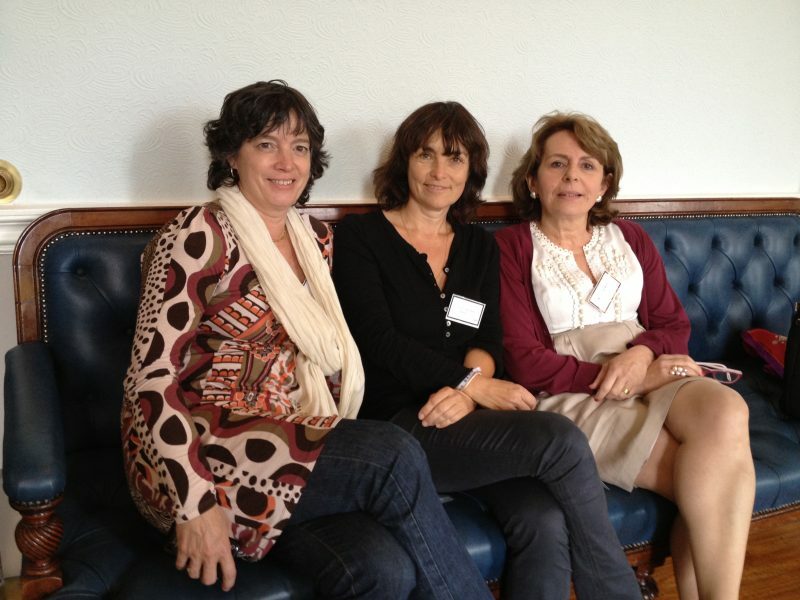 Thirty years later, I have still the same pleasure to discuss Toxin matters with my longstanding friends from that time, Dr Sophie Sangla ( Paris), Dr Sophie Soulayrol, (Marseille), who shared the same passion for the toxin.